Of course you’ve got questions! We’ve tried to answer them below. What does sustainability mean for the Beacon? To be sustainable into the future, the Beacon ultimately needs the support of a substantial number of the 1,100 households in Andover. Last year we received donations from fewer than 290 households, down significantly from the year before. We need to reverse that trend and get closer to 350 households (still fewer than one in three Andover households!) supporting the Beacon with an annual donation. Sustainability also means a large and engaged corps of volunteers who help create each monthly issue of the Beacon and help keep AndoverBeacon.com up-to-date … but that’s a story for another time. Why doesn’t the Beacon just sell more ads? That’s a good question, but the answer is very complex. The Board of Directors has wrestled with that question for years. Here are the basic forces at work, in a nutshell. Despite all this gloom and doom, we think we can maintain ad sales at about the current level for the foreseeable future. But in terms of increasing ad sales by about 30% (which is what we’d need to do to reach sustainability without increasing local donations) — well, that just doesn’t seem to be a viable option. If I don’t donate this year, will I still receive the Beacon and be able to use AndoverBeacon.com? 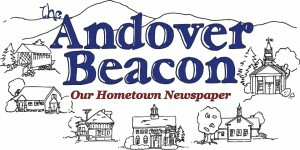 As long as we have enough money and volunteers to keep the Beacon going, our plan is to mail the monthly newspaper to every Andover address at no charge and to keep the latest Andover news up-to-date on AndoverBeacon.com, also at no charge. Anything you can do to help make that happen is greatly appreciated. Anything you fail to do to help make that happen puts the plan at risk – for the whole community. Is my donation to the Beacon tax deductible? The Beacon is published by Community Publishing of Andover, Inc. a New Hampshire non-profit corporation recognized by the IRS as a 501(c)3 tax-exempt public charity. So voluntary donations to the Beacon (not including $30 for each gift subscription, out-of-town subscription, or seasonal subscription) are tax deductible to the extent allowed by law. How much is a “reasonable” donation? Whatever you choose to give is fine. We’re not asking for a specific amount from local households (except that for a gift or seasonal subscription to be mailed to an out-of-town address, we ask for a minimum donation of $30). Having said that, however, we probably haven’t been as helpful as we might be. So here is some more information that you might find useful. Historically, the average donation from an Andover household has been about $40. In our planning and thinking about sustainability for the Beacon, we’ve used that average figure. We know that not everyone can donate that much, while others can, and will, donate that much or more. So whatever amount you feel comfortable with is fine. … pays for these vital steps in keeping the Beacon going. No matter what level of donation makes sense for you, every dollar is greatly appreciated! Sure! You can hand it to one of our canvassers; stop by the Beacon office in the basement of the Town Hall; or leave it for the Beacon with someone upstairs in the Town Office. Sure! You can mail it to PO Box 149, Andover NH 03216; hand it to one of our canvassers; stop by the Beacon office in the basement of the Town Hall; or leave it for the Beacon with someone upstairs in the Town Office. Can I donate by credit or debit card? Sure! Visit AndoverBeacon.com and scroll down until you see the yellow Donate button. Click it, and you’ll be taken to our secure PayPal page where you can enter an amount and pick a form of payment (even if you don’t have a PayPal account). Can I buy a gift subscription for an out-of-town friend or relative? Sure! We’ll need a minimum donation of $30 for a gift, out-of-town, or seasonal subscription. I’m a seasonal resident. Can I get the Beacon mailed to my non-Andover address when I’m not here? Keeping in mind that the Beacon is mailed within a few days of the first of each month, be sure to tell us what your “other” address is and which months the paper should go to which address. I have a question or problem about an earlier donation or subscription. Please contact Donnette at Donnette@nullAndoverBeacon.com or 735-6099, and she’ll straighten it out. Can I take an advertisement in the Beacon instead of or in addition to a donation? Sure! Please contact Donnette at Ads@nullAndoverBeacon.com or 735-6099, and she’ll help you place your ad. If there’s anything else you need or if you have a problem or question, call Donnette at 735-6099 or e-mail her at Donnette@nullAndoverBeacon.com.